It’s time once again for the annual Cinco de Mayo Treats list. Lucinda Hutson’s Jalapeno Carrot Cake — A friend is making this and will report back soon. It seems to be a very dense cake. Chocolate Cinnamon Bundt Cake — Food Librarian recommends this, as does Janice who posted it on the “Go-To” cakes list. Mexican Chocolate Chunk Cookies — These were incredible when made with actual Mexican chocolate ( the kind that doubles as drink mix). Golden Cinnamon Pumpkin Bars — These might be passable as Cinco de Mayo treats, right? Pumpkin? Mayan Chocolate Cookies — I prefer the Tex-Mex cookies, but these were excellent as well. 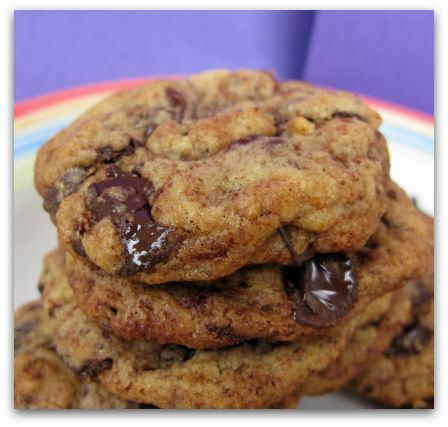 Tex-Mex Chocolate Cookies — Excellent chocolate cookies with a hint of chipotle. Make sure you use natural cocoa powder or the cookies won’t rise properly. Priscilla’s Fiesta Fudge Cookies — A quick and easy prize winner for kids and adults. Oaxaca Fudge Bars with Cashew Topping — These bars made it to Food TV Ultimate Recipe Showdown. Coconut Cut-Outs — Good cut-out dough from Martha Stewart. Mexican Chocolate Biscotti — Cinnamon chips in chocolate biscotti. Chocolate Snickerdoodles — Simple and good. Flan Cake — Kind of a strange cake, but fun and impressive if it works. Frontera’s Mexican Chocolate Streusel Cake — Very moist cake. The hardest part is finding the Mexican chocolate. Tres Leches Cake — Mmmmmmmmm. Three Milks. I love a themed party and I’m really excited to try some of these desserts for Cinco de Mayo! Randi, I’ll have to dig up the chronicle article. Karen, I’d just break the egg in the bowl, separate the yolk from the white and carefully scoop out half. You probably wouldn’t hurt the cake by using a whole yolk. The mexican stresuel cake looks good – I’d like to cut in half – what would you do for 1/2 an egg yolk?? Did you save the houston chrons recipe? Its not availble anymore. I made it like you did( half a recipe) and it was amazing. Robin still talks about it. I have mexican chocolate( its easy to find at Wal*Mart) so I might make half of that recipe. Wow, so many delectable treats!